The following is a short extract from our book, Rails: Novice To Ninja, available to SitePoint Premium members. Print copies are sold in stores worldwide, or you can order them here. We hope you enjoy this extract and find it useful. While this book is unable to cover all of the built-in functionality that ships with Rails—and there’s plenty of functionality for you to discover and experiment with once you’re beyond the last chapter— the plugins architecture of Rails warrants our attention. The number of existing Rails plugins is enormous and grows every day. Programmers in the Ruby and Rails communities are excellent about sharing code and creating useful plugins based on extensions they need. A good resource of existing Rails plugins can be found by searching for “Rails” on the Rubygems site or on the Ruby Toolbox site. Plugins are distributed as gems, which we covered in Chapter 2. Plugins can be pulled into an existing Rails application by adding them to the Gemfile and running bundle install. You probably remember our discussion about Bundler from Chapter 4, where its job is to manage application dependencies. Bundler makes including existing plugins into our app a breeze. Finding a plugin that does what you require is usually just a Google or RubyGems search away. 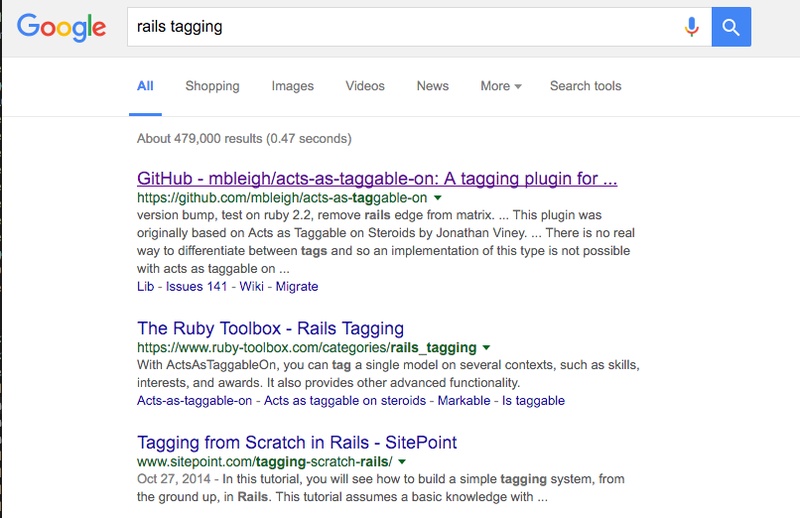 As seen in Figure 10-1, searching for “rails tagging” brings up a few gems that have been created, including one called acts-as-taggable-on. 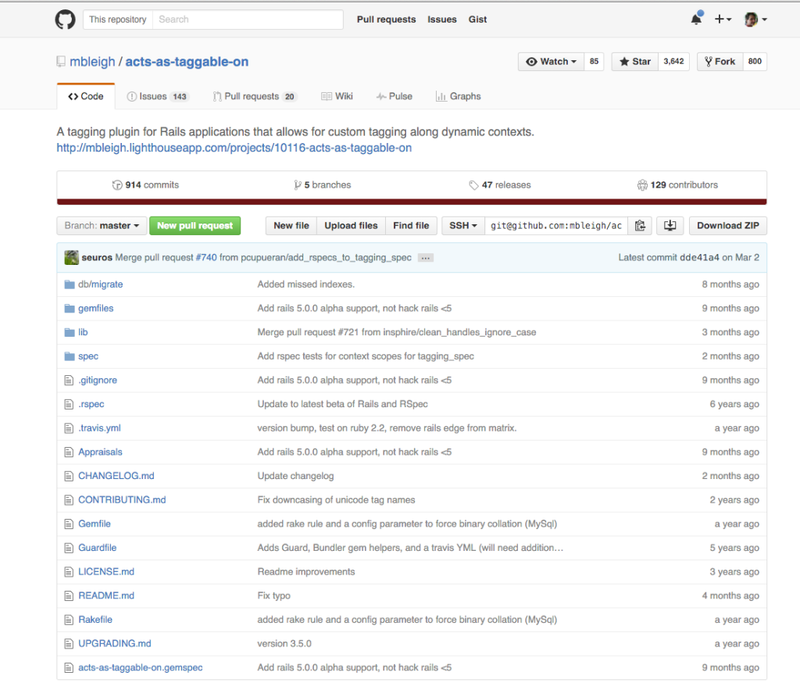 The overwhelming majority of gems keep their source on GitHub, including acts-as-taggable-on from the first link in our search above. Following that link leads to the source on GitHub, as shown in Figure 10-2. Most GitHub source repositories have a README or README.md file that explains what the gem does, how to install and use it, and so on. acts-as-taggable-on follows this convention, which can be seen in Figure 10-3. It explains the object of the gem, the supported versions of Rails, as well as how to install and configure the gem. 10-3. A standard README file. After reading through the README.md, we now know how to pull the gem into our application and use its functionality. You may feel that walking through the topic of "how to find and learn about gems" is a bit tedious, but you will find yourself spending loads of time doing just that–so I figured it was tedium well spent. There are many ways to extend Rails; for example, by using a “plugin”, “engine”, and “railtie”, to name a few. While there are technical differences between these items, they are often (incorrectly) used interchangeably. Defining these terms and their differences is beyond the scope of this book, so I’m going to stick to the word “plugin” for now. As you grow in your Rails-fu, you’ll no doubt want to do some research around Rails extensibility. Boom–I just turned this note into an EXTRA CREDIT! Okay, enough theory! Let’s go ahead and install our first plugin. Tagging is the process by which content creators attach simple textual labels to their data, be it a photo, a link, or a restaurant review. These tags vary widely in their nature; they may be related to location or content, for instance. This results in everyone seeming to have a unique system for tagging data. Currently, the hashtag (#) is probably the most popular form of tagging content with metadata, thanks to Twitter! Tags are definitely more flexible than a category tree, as they allow you to assign as many or as few tags as you like to any item of data. The convention that has evolved is for the user to enter tags for a content item into a text field. Multiple tags should be separated by a space or a comma. Instead of reinventing the wheel and implementing our own tagging system for Readit, we’ll use one of the available Rails plugins for this job, the aforementioned acts-as-taggable-on. You may be wondering what kind of name the developer originally chose for his plugin. At some point, David Heinemeier Hansson himself actually developed a plugin named acts_as_taggable as a proof of concept for some then-new features for Rails. It wasn’t intended for production use, and has since been deprecated, but was picked up again because tagging is such an essential component of today’s websites with user-generated content. 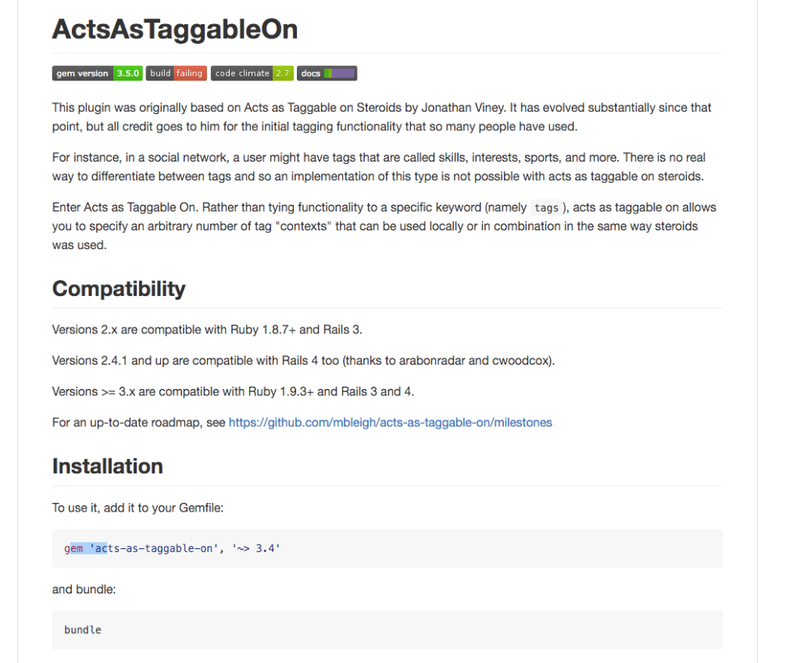 Jonathan Viney, a Rails core contributor and all-round guru, took up where Heinemeier Hansson left off and created his work under the name of acts_as_taggable_on_steroids. Yet development waned, so another developer name Michael Bleigh formed acts-as-taggable-on, and has been developing it ever since. With that bit of family history out of the way, let’s have a look at what this plugin can do for us. As this is far being from an obvious name for a plugin, allow me to explain the background of the acts_as_* naming convention. In Rails’ own plugin repository can be found a number of acts, which are functional extensions to an ActiveRecord model. These acts equip models with certain functionality that usually can be enabled using a single line of code. As this functionality enables models to “act as something else,” the convention of calling these functional additions “acts” arose, and the code that enables the functionality acts_as_something shortly followed. At the time of writing, many "acts as" gems are available on Rubygems.org: acts_as_list, acts_as_tree, and acts_as_paranoid, to name a few. While some are more complex than others, each of these acts apply a hierarchy to a set of model objects. In the case of acts_as_list, objects are positioned in a flat list; with acts_as_tree, the resulting hierarchy is a sophisticated tree system, such as that used in a threaded forum, for example. But what about acts-as-taggable-on? As the name suggests, this plugin provides a simple yet effective means by which you can make your models taggable. It ships with its own ActiveRecord model class called ActsAsTaggableOn::Tag, as well as functionality for parsing a list of tags divided by spaces into separate model objects of class ActsAsTaggableOn::Tag. You probably noticed that the Tag class is namespaced under ActsAsTaggableOn. Namespacing classes inside a gem is a Ruby community best practice based on years of class names stomping all over each other from different gems and libraries. Tag is a fairly common name, so putting it in the ActsAsTaggableOn namespace ensures we avoid loading another gem that clobbers the class. Of course, before we can play with this plugin, we’ll need to install it. The ~> tells Bundler that we want any version in the 4.x series. If 4.2 is the latest, that’s what we’ll get; however, if the versions went 4.2, then 5.0, we’d still end up with 4.2. Make sense? Bundle complete! 14 Gemfile dependencies, 56 gems now installed. As you can see, Bundler runs through all the dependencies of our app, including installing the acts-as-taggable-on into the application "bundle". There’s even a post-install message from the acts-as-taggable-on gem telling us what to do next. The message received after we bundled instructed you to use rake instead of rails. Welcome to the bleeding edge. In previous versions of Rails, rake was used to run tasks like this, but Rails 5 added rails as an alias. This was to allow devs to use rails for all generators and tasks. The tags table stores the ActsAsTaggableOn::Tag model, which is just a regular ActiveRecord model. This table contains one entry for each tag. So, for example, if you tagged two or more Story models with the tag ruby, only one ActsAsTaggableOn::Tag object (ruby) would be stored in the database. This approach makes it easy for our application’s users to find content; if users were interested in finding stories about Ruby, they could browse through all the stories to which the ruby tag was applied. The taggings table stores the actual mappings between the ActsAsTaggableOn::Tag model and those models that make use of the acts-as-taggable-on functionality. # long enough to store the required class names. This migration starts out simply enough. It creates the tags table that contains just one column: name (in addition to the id column belonging to every table). While it may appear straightforward on the surface, the taggings table is a little more complex than a mere list of objects and their tags. As mentioned, it’s possible to make more than one model in your application taggable; however, the mappings between the ActsAsTaggableOn::Tag model and those models to which tagging functionality has been added use a single table. You may be asking what "polymorphic" means in our migration. Hold tight, I’ll cover that soon enough. Before we can give our Story model a little acts-as-taggable-on goodness, we need to apply the migration just generated, as shown below. Great! Now we can make our Story model taggable. Let’s chat about polymorphic associations. To read the full “Rails: Novice To Ninja” book by Glenn Goodrich, purchase the book here. We are also having an upcoming AMA with Glenn Goodrich where he’ll be answering all of your questions about Rails. Sign up for that here.